The fact that Jesus became a human and worked as a carpenter helps us reintegrate faith and work. this is a parallel post with my new website, (re)integrate. The reason Christmas fills me with wonder and awe is that it is the story of our all-powerful, all-knowing, eternal, sovereign, creator God humbling himself to become one of us. This is who Jesus is. And then there he is: Living for nine months in Mary’s womb – yes, Jesus was once a zygote! He grew into an embryo and then was birthed like every other baby. He was laid in a feeding trough. The all-powerful creator God humbled himself to be completely dependent on Mary and Joseph to care for him. Jesus grew in wisdom and stature (Luke 2:52), under the care and tutelage of his parents. He apprenticed under Joseph and learned the noble vocation of carpentry. Let this sink in: Before Jesus began traveling around proclaiming the good news of the Kingdom of God, before he suffered and died for our sins, before he was raised from the dead for our justification and victory over death, he spent the majority of his life building things with his hands. Jesus, the Son of God, worked. Why do I find this funny? Because it puts Jesus squarely on the earth – the same man who performed miracles built cabinets. Working with his hands day in and day out in a carpentry shop was not below Jesus. Jesus did not see his carpentry work as mundane or meaningless, for it was the work his Father had called him to do. 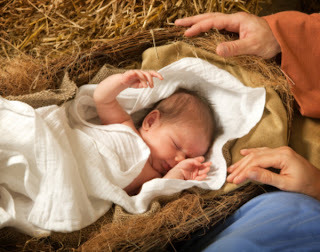 This Christmas, allow yourself to be amazed by the incarnation. God, who is spirit, became human, for we are material. The fact that Jesus came to earth and lived as a human being informs us of God’s view concerning the dignity of our humanness, and the dignity of the material world in which we live. “The Word became flesh,” wrote John, “and dwelt among us” (John 1:14). That is what incarnation means. It is untheological. It is unsophisticated. It is undignified. But according to Christianity, it is the way things are. All religions and philosophies which deny the reality or the significance of the material, the fleshly, the earthbound, are themselves denied. Moses at the burning bush was told to take off his shoes because the ground on which he stood was holy ground (Exodus 3:5), and incarnation means that all ground is holy because God not only made it but walked on it, ate and slept and worked and died on it. If we are saved anywhere, we are saved here. And what is saved is not some diaphanous distillation of our bodies and our earth, but our bodies and our earth themselves. Jerusalem becomes the New Jerusalem coming down out of heaven like a bride adorned for her husband (Revelation 21:2). Our bodies are sown perishable and raised imperishable (1 Corinthians 15:42). All work can indeed be holy. Let’s honor God with our work as we worship him because of the incarnation of Jesus Christ.